Marc Marquez was happy with second place at the Qatar Grand Prix despite failing to make his last-corner lunge on Andrea Dovizioso stick. Marquez and Dovizioso had a thrilling battle at Losail International Circuit on Sunday, with the lead changing hands on numerous occasions. After the pair had seen off the challenges of Alex Rins and Danilo Petrucci, they began an epic fight for the win on the opening weekend of the season. Marquez was overtaken by Dovizioso at the start of the final lap but still had a chance to win, his dive down the inside at the final turn not enough to stop the Ducati taking victory. While disappointed, the Spaniard was pleased with the performance of his Repsol Honda after a mixed pre-season. "It was exactly like last year," he said. "Exactly the same! "I tried to push but here in the circuit when you overtake on the dirty place, you just go wide. It was so difficult to keep the line. "Anyway, I tried, I tried to be there, I tried to push, I tried until the end. But I'm very happy with these 20 points. After an INTENSE race long battle @marcmarquez93 clinches at the #QatarGP! "Especially because it's a circuit that we struggle [at]. This weekend we were struggling a lot with the front tyre. If you see, we put the medium, I wasn't able to push like I would like in the brake points. "But okay, we finished the race with 20 points. One race, that normally we struggle at, less from the calendar." For Dovizioso it was a welcome start to the campaign, as he looks like to depose three-time defending champion Marquez. "It was a strange race," said the Italian. "Overall, I'm so happy. 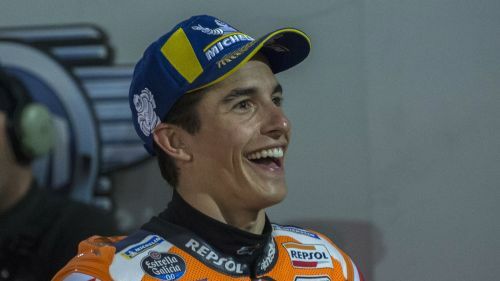 "I saw Marc struggle a lot with the rear tyre in the last lap, so it was good for me to understand that and I pushed really hard in the last lap. "But Marc never gives up, he's always there - but I was able to answer because I put him really on the limit."